‘Honestly, how can we have ‘valid’ second language courses if we don’t also have ‘valid’ assessments? !’ asked @dr_dmd. This hypothetical question summed up the core discussion of last Thursday’s #langchat: What are valid assessments and how can teachers make time for them? @soccermom2013 said, ‘Yes, performance is an assessment BUT when do you call them summative and formative and how do you grade them?’ @tiesamgraf responded with Robert Stake’s definition of summative and formative assessment: ‘When the cook tastes the soup, that’s formative: When the guests taste the soup, that’s summative.’ While teachers know that both are necessary for students to gain proficiency in the second language, it is hard to find time to do both on a regular basis. But this does not need to be the case. #langchat participants came up with some best practices for doing valid summative assessments that take less time. These smaller, formative assessments can easily be done in a few minutes and are able to give an accurate depiction of student learning over time. While these will not entirely replace the large-scale summative assessments that most districts require, #langchat participants came up with some great ideas on how to use daily formative assessments to create a body of assessment data for students. Use a clipboard. 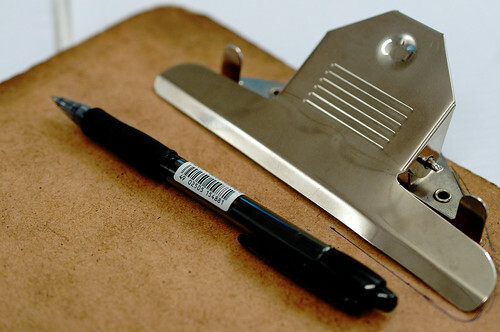 @dr_dmd, @soccermom2013 and @SenoraMcLellan all said that a clipboard is an easy way to do formative assessments on the run. @soccermom2013 suggests putting a rubric for performance on the clipboard and checking it off as teacher’s watch their students interact in class and with each other in the target language. A few teachers discussed the pros and cons of going outside of the school or district to purchase outside assessments. @tiesamgraf said, ‘I advocate for departments/districts to move towards external assessments for validation of movement toward proficiency. Some teachers agreed with this idea, but cited problems with cost and accuracy. Finally, @dr_dmd helped to clarify the most important elements of the night through a series of “wrap-up” tweets. #langchat teachers decided that performance is the most authentic and valid way of assessing students, but that it was important for teachers to focus more on communication goals than grades. Thank you again to our moderators @dr_dmd and @CoLeeSensei for allowing for some great discussion and clarification on the topic of valid assessment. Also, thanks to everyone who came out and actively participated. It is great to share struggles and successes with you! Please help us be a better professional learning community by sharing with us what you would like to chat about during #langchat. Visit us online to share you topic ideas for upcoming chats. You can also find a complete transcript of last Thursday’s chat in our archives.